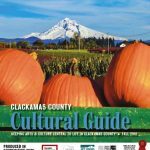 For the third time running, the Clackamas County Cultural Guide won an award in the Better Newspaper Contest, put on by the Oregon Newspaper Publishers Association. The publication took second place in this year’s competition in the special section category for publications of similar size. We are so proud of this distinction and wanted to share the good news with you, our readers. The Clackamas County Cultural Guide, a quarterly arts, cultural heritage and tourism guide for Clackamas County, is produced through the partnership of the Clackamas County Arts Alliance and Pamplin Media Group. This award recognizes the high-quality work of Pamplin’s reporters, photographers, production crew, and sales team, as well as the caliber of the events they write about. In each issue, we feature amazing artistic and cultural projects, artists, art organizations and cultural advocacy groups who work hard to make life in Clackamas County rich and stimulating for all. I read this article and found it very interesting, thought it might be something for you. The article is called Clackamas County Cultural Guide Wins Again! 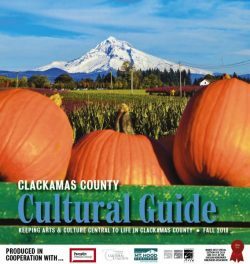 and is located at https://clackamasartsalliance.org/uncategorized/clackamas-county-cultural-guide-wins-again/.